When I am photographing a quilt for a quilt show submission, when I am auditioning where I want to hang a quilt or mini quilt, or even when I am photographing a quilt outside in low breeze conditions, I like to use painter’s tape to hold up my quilts. First, I run a piece of tape along the upper and lower edges of the quilt. Then, I make many small “rolls” of tape to stick along the first line of tape that was pressed firmly into the quilt. 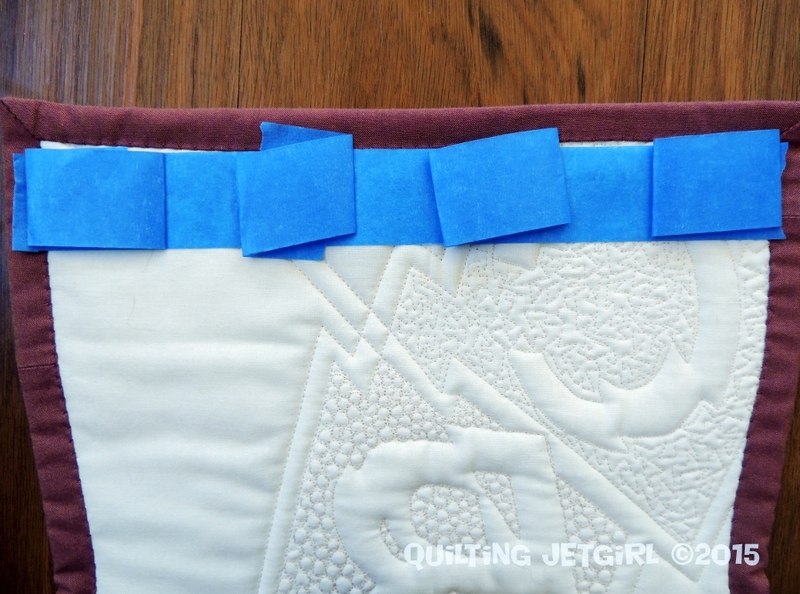 I have found that for mini quilts, this is often all I need to secure the quilt to the wall for many months. Note that I am using the delicate painter’s tape from the hardware store. I have not had any issues with residual tape stickiness being left behind on my quilts. I do feel a bit like a “yoga spider” when I do the dance to hang a larger quilt on a wall using this method on my own, but with a bit of persistence and planning, it has been a very non invasive way to temporarily tack my quilts up for photographic purposes. 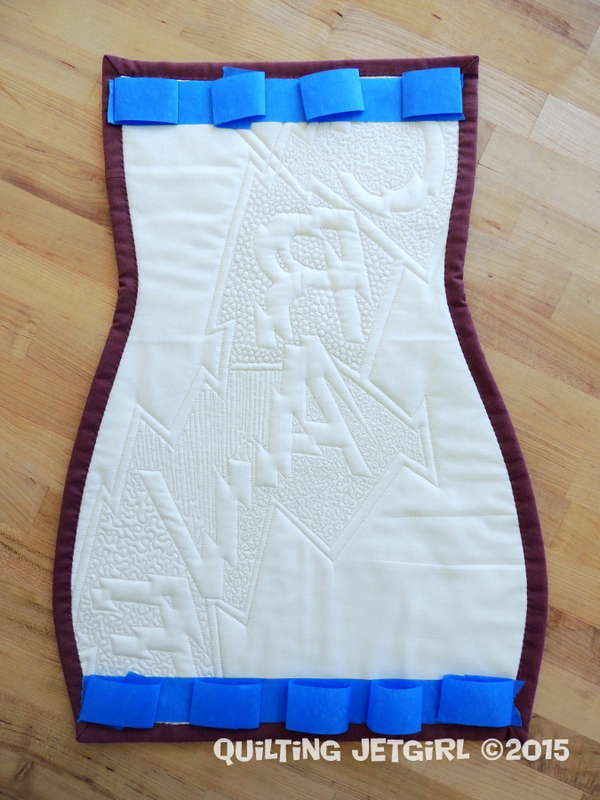 Linking up to Tips and Tutorials Tuesdays @Late Night Quilter. Okay thanks for this.. I’ve just been trying to get little rolls to stick to the quilt — but it hasn’t been working. never thought of putting a long bit on first. I’ve put off taking pics of a few things because I couldn’t get them to stick! I’ll have to try it tomorrow! I hope i can find my tape ! Painters tape is definitely handy for lots of quilting needs! Well aren’t you clever! Great tip, thanks. Good tip. I recently discovered the merits of using the “blue” tape. Good tip, Yvonne! I usually use thumbtacks! Or if it’s just a flimsy, I’ll slap some pretty Washi tape across the corners. Love that tip! Thanks for sharing! Great tip!!! Thanks for sharing!!! I totally used double sided tape to put up a tiny mini quilt someone gave me. Painter’s tape is a good idea, I’ll try that next time (also I’ve run out of double sided tape). Perfect, I’m almost at a point where I want to hang my mini quilts and I’ve been wondering how best to ‘audition’ them on the wall. The extra piece of tape is brilliant! Thanks for sharing. I have tried tape before and it never seems to hold up, I never have tried the piece of tape across the back first though, I am going to have to try that. Excellent idea! I like that blue tape, as it doesn’t leave any residue behind. I really need to stop neglecting my blog reading so I don’t miss your great tips! I learn so much from you. Thanks for sharing! I love this! I never thought of the extra rolls of tape… I use the frog version of it as I couldn’t get it to hold up well, but you use extra force! haha. I still have plenty of this blue left… I need to get to hanging. You do have great tips! The trick is the first strip you put down; I hope it is helpful for you, too! What a good idea!! Thank you.